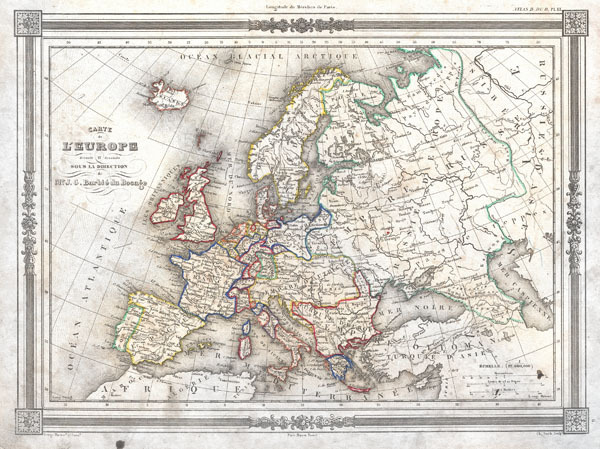 An uncommon and attractive 1852 map of Europe by J. G. Barbie du Bocage. Details all of Europe including Iceland as well as parts of Asia and Africa. Shows the Austrian Empire at its height, the many states of the German Confederacy, and a pre Garibaldi Italy split into numerous small Duchies and states. Features a beautiful frame style border. Prepared by J. G. Barbie du Bocage for publication as plate no. 3 in Maison Basset's 1852 edition of the Atlas Illustre.